Natal Downs southwest of Charters Towers, after a big season in 2014. Click on image for a larger view. 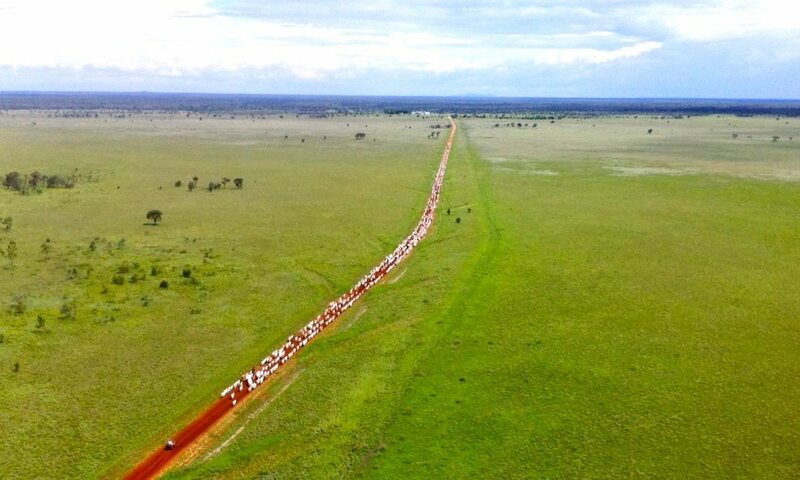 LISTED property trust Rural Funds Group has made a $53 million investment in the northern beef industry, purchasing Camm Agriculture Group’s three North Queensland grazing properties in a deal where the Camm family will lease-back, and continue to manage the assets. Included in the deal are Camm Agriculture Group (CAG’s) three adjoining breeding and growing properties southwest of Charters Towers – Natal Downs, Longton and Narellan, covering 390,000ha. The group’s Wonga Plains feedlot near Bowenville on Queensland’s Darling Downs, and finishing properties near Clermont were not included in the agreement with RFG, but will continue to play a role (see details below). Rural Funds Group (RFG) has a diversified ag investment portfolio covering almonds, poultry vineyards, cotton and macadamias, and to a lesser extent, beef. All of its agricultural assets are leased to experienced agricultural operators. It’s exposure to the beef industry only started a year ago, with the purchase of Gulf breeding properties Mutton Hole and Oakland Park, totalling 225,00ha between Croydon and Normanton, and quality buffel grass/leucaena backgrounding/finishing property Rewan, 18,000ha near Rolleston in Central Queensland. Once the deal with CAG is complete, cattle assets will represent about 16pc of RFG’s investment portfolio. RFG’s three existing assets were valued at 30 June at $55 million (property and cattle). Under the deal with Camm Agriculture Group, a trust will also fund the purchase of new cattle, lifting RFG’s overall commitment to about $72 million. Further development work on the Natal property aggregation is expected to enlarge carrying capacity. The agreement will allow the Camm family to reduce debt and help facilitate an inter-generational transfer of assets and management. The properties will be leased back to a Camm family business for ten years, with rent indexed annually at 2.5pc, with a market review at the end of year five. The CAG assets have been offered to investors in an off-market fashion for the past two or three years. Ray White Rural listed the assets under an expressions of interest in 2014. At that time the Camm Group was running more than 33,000 cattle on the aggregated properties. Natal Downs has historically carried 7000 breeders plus 5000 steers, while Longton has carried 15,000 breeders, and Narellan, 2500 breeders. Rural Funds Group said it had identified development opportunities to increase the carrying capacity of the properties and will provide $2.5 million to CAG to undertake capital expenditure. The trust will also provide a $5 million livestock lease facility, allowing the Camms to acquire cattle, with the listed trust to own them. The security arrangements associated with the transaction require that CAG provide first mortgages over two other CAG-owned grazing properties independently valued at more than $20 million as security for its lease, loan and livestock facility. Not included in the deal is the Camm family’s 9000-head Wonga Plains feedlot near Dalby, which will continue to provide a grain-finishing resource for company cattle. Wonga Plains is currently undergoing a license expansion application, designed to double feedlot capacity to about 21,000 head. If the integration of RFG’s existing cattle assets and the new CAG properties was to occur, that expansion could provide a handy production stream for company cattle. “We have had discussions with RFG about that prospect, but it is too early to say,” CAG spokesman Bryce Camm told Beef Central. “There is certainly no intention to roll both businesses into one, at this stage. What RFG does with cattle on its other assets is up to them,” Mr Camm said. Rural Funds said buying the CAG aggregation was part of its strategy to identify natural resource predominant assets with the potential for capital growth through property improvements. RFG’s website says its investment objective is to generate a stable income stream derived from leasing its assets to suitable counterparts and capital growth through any appreciation in the value of those assets.